Combining good old fashioned values and service delivered in a modern and efficient manner, The Orchard has come to embody the kind of place we hope you will like to shop. The emphasis is on vintage inspired living. A nod to the style of the past and all the practicality that came with it. 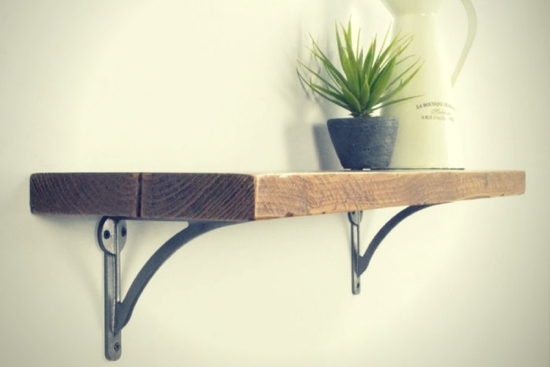 Nature is also a big influence, natural materials abound, with plenty of beautiful sustainable wood - new, old and reclaimed. Pretty and practical are watch words for all that we source, with an increasing emphasis on British design and manufacture. We champion some Great British brands, as well as nurturing our own collections of furniture made here in Leicestershire. Whether it's something for the inside of your home or for the garden. For yourself, or a gift for another, walk into The Orchard, we are sure you will love what you find. 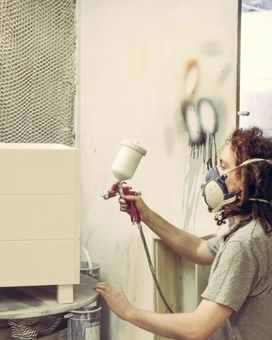 Search 'The Orchard Furniture' for our bespoke furniture collection. June 2017. 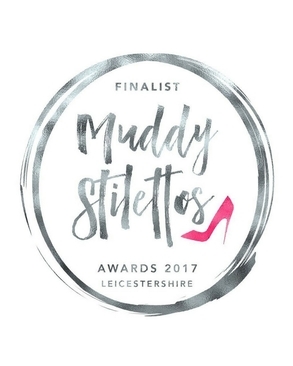 Muddy Stilettos 2017 Awards Finalist Nominee. Nominated by the lovely folk of Leicestershire, as one of the Best Interiors Stores in the region. The Orchard proudly formed part of the Leicestershire retailer community in 2008. Our workshop, warehouse and dispatch facility is based in the heart of Leicester, within a network of local small businesses. 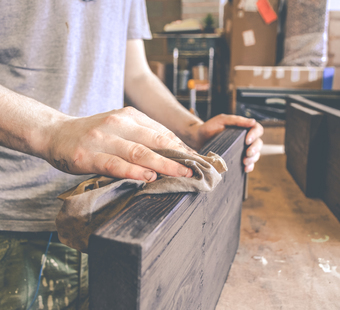 Our furniture is manufactured locally, just up the road in Nottingham and each piece is finished by hand at our in-house workshop in Leicester. Standard Delivery Information:Standard delivery is estimated within 2-5 working days. Larger items of furniture will usually be delivered within 21 - 35 days from date of order, unless a Special Order, Made to Order item. Please note that large/heavy items such as furniture will be delivered by courier and will require someone to be home to receive the item. Weekend delivery is not available. Delivery - Customer Responsibilities Once a date has been scheduled and confirmed with the courier, it is the Buyers responsibility to ensure they are available on the stated delivery date. If the customer is unable to accept delivery on the first scheduled delivery attempt, a further delivery charge at he same rate, will be levied. Once payment for this second delivery has been made to us, a further delivery date can be scheduled. It is the customers responsibility to ensure the delivery address given is accurate. If the order is sent to an incorrect address, given by the customer, the customer will be charged for the collection and return delivery of that order. If the customer wishes the item to be resent to a different address, the customer will be charged again for the outbound delivery. In cases where the order has been sent via one-man overnight courier, you will be notified of your delivery date via e-mail. If you are unavailable on the delivery date, a card will be left at your premises. If you do not respond to this card, or re-arrange a suitable delivery date within 5 working days, the item will be returned to sender and there will be a re-delivery charge, at the same rate as the original delivery charge. This must be paid prior to a re-delivery being scheduled. Recycled Packaging Wherever possible, The Orchard aims to reduce packaging wastage by recycling the outer packaging boxes. Therefore the description on the outerbox may not always be the same as the contentys! 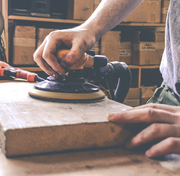 Access of Pre-built Furniture As the majority of our furniture is fully assembled, please ensure you measure your access points in advance of delivery. In case the item does not fit, the customer will be responsible for covering the cost of returning the item to The Orchard within 7 days. The Orchard’s courier partners insure against damage caused during transit and it is The Orchard’s policy to do the utmost to replace damaged items within 30 days (dependent on stock levels). All possible steps have been taken to ensure your item is securely packed and dispatched with reliable, trained furniture courier companies, however on very rare occasions damage may be caused during transit. In order to ensure The Orchard can claim on behalf of our customer, for any damage caused during transit, we ask that following advice is adhered to: . • At the point of delivery, please ensure you open the outer packaging and inspect your item(s) for any damage. Any items which are received with damage to the outer packaging (no matter now small the damage) please sign for as ‘Damaged’, with a brief detail of what the damage is, i.e. dent to left side of box, tear to outer packaging, etc. In cases where you are unable to inspect the goods, please mark the courier’s delivery manifest as ‘unchecked’ or in instances where the courier does not allow inspection, please mark the sheet as 'Courier refused inspection of goods'. • Once you are satisfied that your item(s) is in good condition, please sign the driver’s manifest. Please note, that upon signing the manifest, the courier company can no longer be held responsible for any damage which may have been caused to the item(s). Claims for damaged items can only be processed if the delivery manifest has been signed for as ‘Damaged’ – (see paragraph above). • At the point of delivery, if you find your item has been damaged in transit, please do not accept the delivery and request that the courier returns the item to The Orchard. Please ensure that the item has been securely re-packaged. Please inform The Orchard within 24 hours if you have refused a delivery and give details of the type of damage. Description of Products We take all reasonable care to ensure that all details, descriptions and prices of products appearing on the site are correct at the time when the relevant information was entered onto the system. Although we aim to keep our site as up to date as possible, the information, including Product Descriptions, appearing on this site at a particular time may not always reflect the position at the exact moment you place an order. Colours We have made every effort to display as accurately as possible the colours of our products that appear on the site. However, as the actual colours you see will depend on your monitor, we cannot guarantee that your monitor's display of any color will be accurate. In case you wish to return an order to The Orchard, please notify The Orchard via email within 7 days from the date of receipt of your order. The Orchard will authorise any returns which require a courier to collect. In case your order has been received with a fault/damaged, please notify The Orchard directly and, if suitable, a collection will be arranged of your item. Refunds are processed within an estimated 5 days, upon return receipt of the customers item in good condition. Orders for bespoke items can be cancelled up to 7 days from the point of order for a full refund. Orders which are cancelled 7 to 14 working days after point of order will be subject to a 75% refund, due to the item having already gone into production. Due to the bespoke nature othese items, once the 14 working day cancellation period has elapsed it will not be possible to cancel the order, or return the furniture for a refund after delivery, due to the item being unsuitable/no longer required.